I'm finally digging into my Holiday catalog items and boy is it hard to think fall and winter and Christmas when the temps are in the 90s! Even though school is starting here on Tuesday there is nothing that feels like cozy sweaters and hot chocolate are in our near future. The only hot chocolate might be a Snickers bar that got left in the car! But as it's a Fab Friday challenge Friday I've got a card to share using this great sketch! My card uses all new Holiday catalog items which will be available on September 1st. And I must say that even if I'm not in the mood for fall just yet I enjoyed these fun new products. The card front is first covered with this lovely Merry Merlot colored DSP from the Joyous Noel Specialty paper pack. Next, I embossed a bit of the awesome Galvanized Metallic paper with the Tin Tile embossing folder. The sentiment from Falling for Leaves was stamped on vellum in Mossy Meadow ink and the adhered on the backside of the embossed panel. I stamped the cluster of leaves 3 times once each in Crushed Curry, Merry Merlot and Mossy Meadow. I adhered them together with glue dots and then tied a bit of Braided Linen Trim around the stems. They are then attached to the card front with dimensionals. I hope to see your version of this sketch shared in the Fab Friday gallery! Remember you have 2 weeks with our challenges. Head over to the Fab Friday site to see the rest of the Design Team. So have you all missed me this summer?? I have been MIA and I don't even have a good reason other than the lazy days of summer have been in full effect in our house. We are squeezing every last ounce of laying around doing nothing in these last few weeks before school starts again. But for now I did rouse myself to get to the stamp room so I could make a card for this week's Fab Friday challenge. It's a doozy this time! 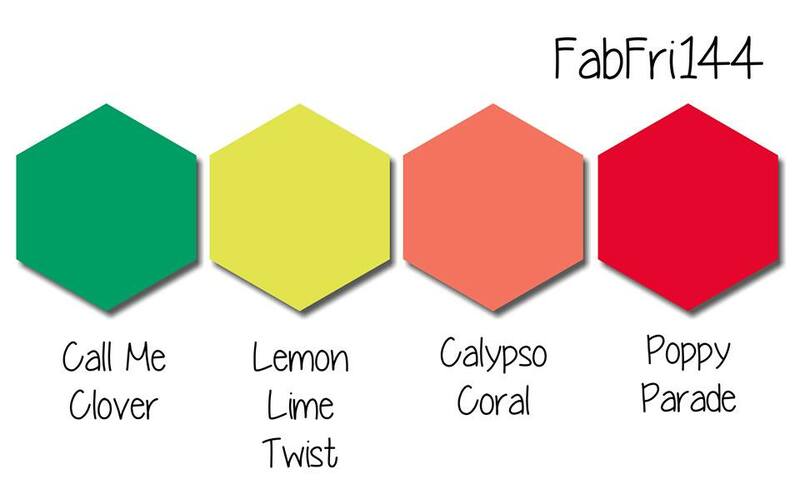 Check out these bold, bright colors! Perfect summer colors! I pulled these colors out and left them sitting on my desk for a few hours before stamping and I would peek at them every so often in between the busyness of being lazy just to get a feel for them. A nice bold silhouette was the direction I wanted to go in so my Rooted in Nature set that I LOVE was close at hand with gorgeous tree shapes to choose from. My first step was to watercolor 3 of the colors onto watercolor paper; Poppy Parade at the top, Calypso Coral in the middle and Lemon Lime Twist at the bottom. I will say the Poppy Parade and Calypso Coral looked pretty much identical until the paper dried at little and even then it's pretty close but I think you can see that the middle color has a hint of pink. After the watercolor paper was dried with the heat tool I dripped some water drops onto the colors (yes on purpose!) and then blotted them up with a paper towel. I like the effect as it gave a bit of depth to the watercoloring. Next, I embossed the tall tree in black embossing powder right onto the watercolored background. To enhance the black tree silhouette I added a few black faceted dots and a strip of black cardstock along one edge. The thank you sentiment is stamped in Call Me Clover on a scrap of watercolor paper and popped on dimensionals. The whole panel is mounted on a Call Me Clover base. 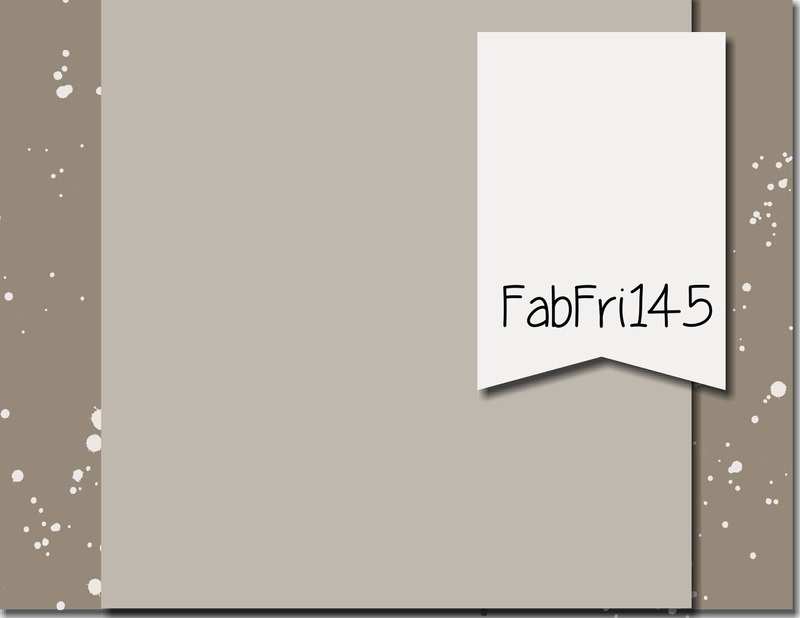 Check out all the wonderful ideas using this color combo over at the Fab Friday site. The Design Team knocks it out of the park every challenge. And we can't wait to see what you come up with so please play along add your card to the gallery.